A number of fall picture books feature familiar characters. 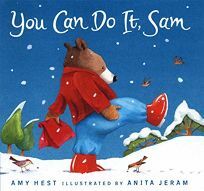 In You Can Do It, Sam by Amy Hest, illus. by Anita Jeram, this third Mrs. Bear and Sam the cub story finds the mother-son duo cooking up ""a tasty surprise"" for their neighbors. The title, however, doesn't refer to what's going on in the kitchen, but rather what Sam does after the goodies are stuffed into red gift bags-and his mama asks him to play Santa. Although Jeram uses the same rounded lines and subtle colors that make the interior scenes so snuggly, she's equally accomplished at conveying the icy light and crisp air of a winter morning.